Can A Naked X-Men Character Make You Care About The Kia Sportage? The automaker certainly has our attention. 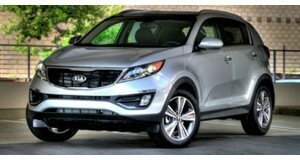 The Kia Sportage doesn’t get a ton of attention on CarBuzz, but even we can’t ignore this version of the crossover. The Korean automaker has teamed up with Twentieth Century Fox and the X-Men film franchise to create a Mystique-inspired Sportage. In case you don’t follow the series, Mystique is the blue, scaly mutant who can take the look of other people. Oh, and she’s usually naked when in her blue (normal) form. Jennifer Lawrence currently plays the part, with Rebecca Romijn handling the role before her. The Sportage gets a special “tone-on-tone” matte and gloss blue finish, some yellow accents on the body and nifty racing wheels and tires. Other than that, well it’s just a regular old Sportage. Kia is prepping a special video starring tennis superstar Rafael Nadal and the special CUV which will be released January 4. The car will make its live debut at the 2016 Australia Open in January. If it’s a good all-rounder compact crossover you’re after, the Kia Sportage is a worthy candidate to consider.